I was invited back today to play Mah Jongg with the ladies who live in my apartment building. 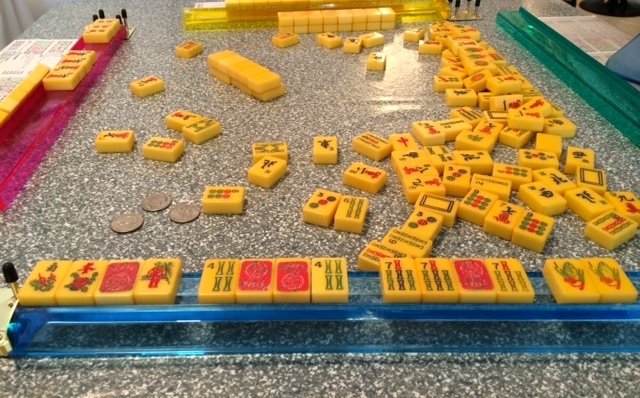 It is interesting to me to note how very different it is to play with a contrasting and divergent group of people from the OMs – nothing will ever be as wonderful as playing with my beloved OMs – and yet there is still the comfort of the NMJL card and the click clack of the tiles and the familiar cry of “Mah Jongg!” That is part of the allure and beauty of the game – no matter where you are and with whom you are playing, ultimately it is all comfortably familiar. 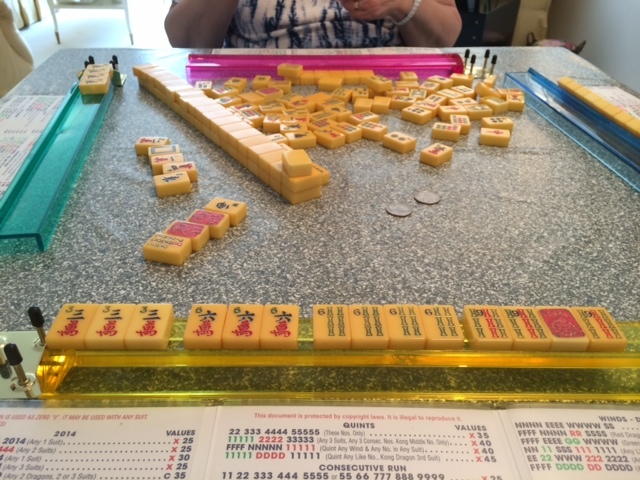 I had a very successful Mah Jongg day, which happens to be personally rewarding to me since this particular group of women has all been playing for so many years. Adele, and it is in her lovely apartment where we play, has been at this game for over 50 years. Her quiet game play offers much to be learned; Jan – who also has been playing for many, many years – offers a great lesson in how to play defensively and cleverly. I love the experience of still being able to learn new things each time I play. My first Mah Jongg hand was this 13579 hand: 55 77 555 777 9999. I earned $1.00 on this hand because East had rolled doubles and I picked the winning tile myself. That’s a nice way to start the day! Next I put together the following 369 hand: 333 666 6666 9999. Another hand that was successful for me today was this 13579 hand: FFFF 1111 33 5555. I kept getting confused when a Three Crak was discarded, thinking that I need another but finally realizing that I only needed two of that tile and needed to focus on the Five Craks – but fortunately I picked up 2 Jokers as the game was close to the end! My last hand of the day – for me, that is, as the ladies continued to play long after I needed to leave – was one more lucky Joker hand for me. 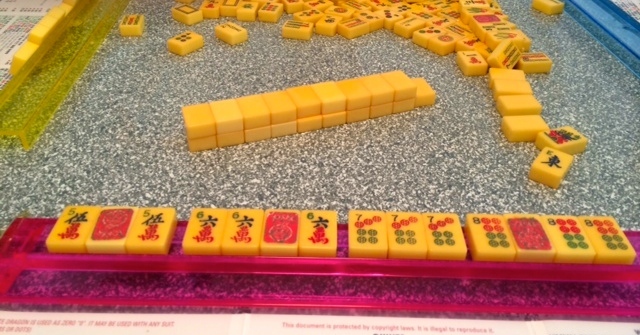 I was so happy to declare Mah Jongg with this hand as I had never played it before and was delighted to complete the Addition Hand of FFFF 4444 + 7777 = 11. This entry was posted in Mah Jongg and Me and tagged Crak, doubles, east, Joker, mah jongg, Sunday on June 30, 2014 by Mah Jongg and Me. I was given a set with tiles like these. The racks are opaque though. It has a mock crocodile red case. It was used by 2 friends who have passed. I was told these are butterscotch Bakelite. Is it a valuable set? I had to convert some flowers with joker stickers. Is that what you did? Hi – thanks for reading the blog! OMs stand for the Original Mahjettes, which is what we call the six of us in our Wednesday Mah Jongg group!! We took lessons together and now play every Wednesday, rotating the venue from apartment to apartment. We serve a wonderful lunch at noon and then play until…whenever! Every three or four months we go away to one of the OMs weekend homes – in Sag Harbor, Buck Hill, Old Chatham, or another upstate New York location and have what we call a three-day Mahjathon consisting of cooking fabulous meals and playing Mahj from early morning to late, late night. Yes, on my vintage sets I look for matching tiles to use for Joker stickers. Sometimes the sets come with extra Flowers and those can be used. As far as being able to determine what your set is worth, I would need to see the tiles. Can you email some pictures to me? In terms of being valuable, I feel that every vintage set is valuable, whether it just is for the sentimental value or the actual dollar value. Give lots of love to your vintage set and try to imagine where it once lived!